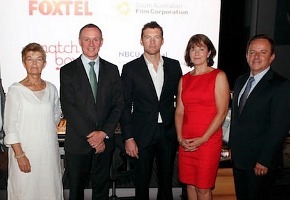 Foxtel’s 2015 drama project Deadline Gallipoli (formerly The Gallipoli Story) held a launch at the South Australian Film Corporation’s Adelaide Studios on Wednesday, attended by Premier Jay Weatherill and Executive Producer and star, Sam Worthington. Also attending were Foxtel execs Brian Walsh, Penny Win, plus Matchbox Pictures’ Penny Chapman, FullClip’s John Schwarz, SAFC’s Judy Potter and Viron Papadopoulos, and Adelaide Film Festival Director Amanda Duthie. The mini-series, to provide about 1300 jobs in South Australia, follows a team of journalists who were embedded at Gallipoli during the First World War and how they triggered the decision to end the Gallipoli campaign. “It is an exciting production that will mark the Centenary of the ANZAC internationally,” the Premier said. Worthington will star as writer Phillip Schuler with further casting announcements for the roles of central figures such as Australian journalist Charles Bean, Keith Murdoch and Britain’s colourful Ellis Ashmead Bartlett to be announced soon. The story also explores the story of the young soldiers sent to Gallipoli to fight, their growing realisation that British command was tragically unprepared for the campaign and their efforts to get their stories out, despite a brutal censorship regime. Deadline Gallipoli has been written by Jacquelin Perske, Shaun Grant, Stuart Beattie and Cate Shortland. Worthington’s production company FullClip and Matchbox Pictures will produce the mini-series, to be directed by US based Australian director Michael Rymer (American Horror Story, The Killing, Longmire, Hannibal, Battlestar Gallactica, Angel Baby). It will air on Foxtel in 2015.